New AMANTA bedroom - sleep in the heaven • JELÍNEK - výroba nábytku s.r.o. Our company has already joined forces with the successful and talented designer Jaroslav Juřica. The result of this collaboration is the unique Amanta bedroom suite, which thanks to its illusion of levitation acts directly above ground! A characteristic feature of the Amanta collection is the illusion of levitation. Amanta’s bed acts as if it denied the laws of terrestrial gravity and floated above the ground like a light feather. 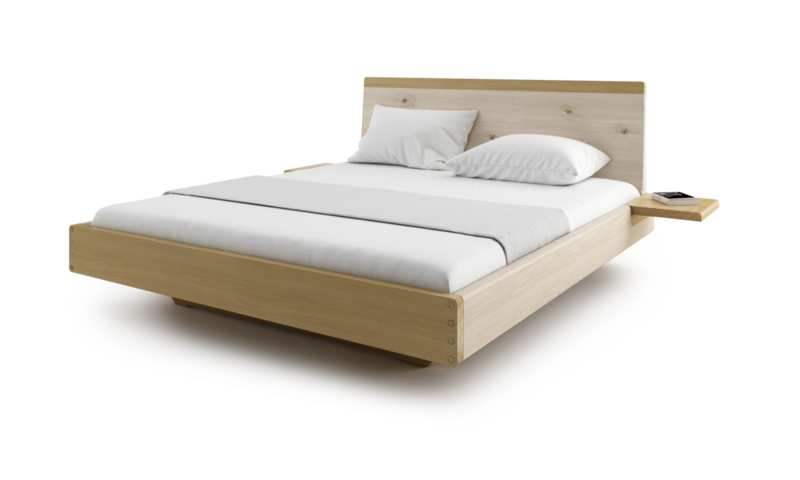 Considering the bed made of solid oak wood, there is a unique contrast, when the solid wood acts suddenly very lightened without actually losing its strength and volume. The touch of the bed floating above the ground is enhanced by night shelves that are connected to the sidewalks of the bed and evoke such small wings. This unique levitating effect of the bed is achieved by a significantly reduced socket, which can not be seen when looking at the bed. The minimalist design underlines the clean and airy nature of this collection. The Amanta bed is also very impressive with its full wooden forehead, on which are intentionally acknowledged bows. Natural oils are further emphasized by the detail of the head forehead and the shelf attachment to the side of the bed. Exclusive Amant bed is available to our customers in a variety of sizes, with special adjustments and storage options. The Amanta collection also includes a spacious wardrobe and practical chests of varying sizes. This complementary bedroom furniture is also made of solid oak wood and its pure, simple design fits perfectly into the atmosphere of the entire collection. Both the cabinet and the komodo can also see a slightly reclined plinth that perfectly matches the design of the bed. The Amanta Furniture Collection uniquely combines two color shades to make the furniture invigorate. In addition, the two-color combination provides a versatility when integrated into the interior, which uses more color shades. For the Amant collection, natural color oils are used to perfectly protect wood, preserve its natural artwork, and provide a wide range of colors including rich shades. For our Amanta collection we created 4 basic color combinations. In case of your interest, however, you can choose any of the shades in our painting and oil painting. The common element of the Amanta furniture collection is also the deeply rounded edges that are both functional and ergonomic. Rounded edges will be appreciated especially at the side of the bed while sitting on the mattress. Another extraordinary feature of this bedroom suite is further admittance of the siding of the sidewalls and the fronts with strong pin joints. Drawing solid wood with visible pores adds a unique aesthetic expression to the Amanta bedroom. Amanta’s bedroom was premiered at FOR FURNITURE 2015, which was held on 19-22. 3 2015 in Prague. Here we have successfully presented our new bedroom as part of the Design Shaker show. The jury has awarded our prestigious GRAND PRIX award to our Amanta Collection, which is a great pleasure!